Rollie Fingers is a former relief pitcher who played in Major League Baseball for 18 years. Fingers played for the Oakland Athletics from 1968 to 1976, the San Diego Padres from 1977 to 1980 and the Milwaukee Brewers from 1981 to 1985. 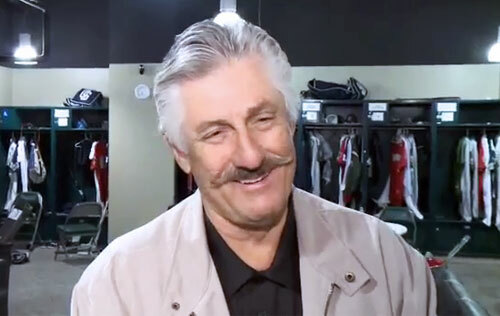 Rollie Fingers was elected to the National Baseball Hall of Fame in 1992, the second of only two relief pitchers at that time to have earned that honor. In 1981 he earned the Cy Young award plus the American League MVP award. Rollie Fingers was also one of only eight players who have had their numbers retired from more than one team. PFP Sports Talent Agency is a top booking agent for motivational sports speakers and sports personalities. If you would like to book MLB stars like Rollie Fingers for a speaking engagement, personal appearance or special event, you can request Rollie Fingers agent and speaker information from PFP Sports Talent Agency or call 800.966.1380.